Our original plan is to have lunch in Wong Chi Kei, the famous noodle house in Senado Square. However this restaurant was full when we passed by so we decided to check other restaurants around. We were walking towards New Yaohan Mall when we passed by Solmar Restaurant. I immediately remembered this restaurant being mentioned in Lonely Planet guidebook so we decided to take our lunch here. Solmar is famous for its authentic Portuguese cuisine and people still flock the restaurant even its already 2pm in the afternoon. We ordered their best seller African Chicken, pork chop bun and a few other dishes. Although quite on the expensive side, the food is worth it as all the meat dishes are tender and of generous serving. Prepare to shell out approximately MOP120.00 per person (USD16.00). Solmar is located near the corner of San Ma Lo and Avenida da Praia Grande across Metropole Hotel. We had lots of shopping bags with us (local delicacies from Koi Kei Bakery) so we decided to go back to Venetian to leave our things and rest a bit. This time we tried a different route to go back to our hotel. From Solmar, we walked for about 10 minutes towards Hotel Sintra which is in the corner of Ave. de D Joao IV and Ave. Almeida Ribeiro. Shuttle to City of Dreams is available outside Hotel Sintra, however it is not very frequent. We waited for about 20 minutes before we were able to catch the shuttle. Had we known earlier that the shuttles going back and forth Hotel Sintra and City of Dreams operate in less frequency, we could have used the same route we took in the morning – Grand Emperor – Ferry Station – Venetian. From the lobby of City of Dreams, we transferred to Venetian via the Cotai Connection shuttle. After a bit of rest, we headed to Wynn. We boarded the Venetian shuttle to go to Macau Ferry Station then switched to Wynn shuttle there. The Macau downtown lights is not to be missed. 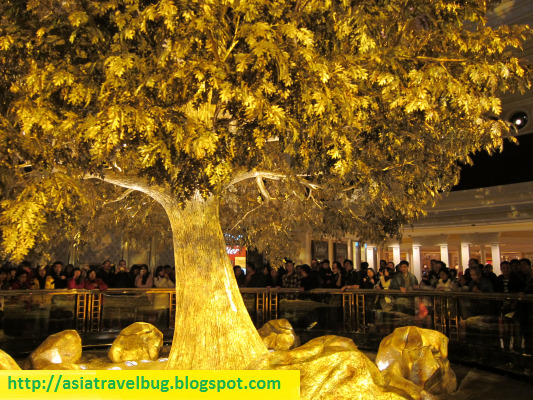 Going to Wynn Macau during night time is one of the best decision we made. Just outside the Wynn lobby, the view is very colorful and breath taking. You should not miss taking a photo by the Wynn fountains with the colorful casino skyscrapers as the backdrop. The free Wynn musical fountain show which runs every half an hour is also spectacular. While waiting for the indoor shows, we had our dinner in Restaurant 8 inside Wynn Casino. The food is good but servings are small. Both of the indoor shows are good with mind-boggling special technical effects considering they are free. We took the same shuttle route – Wynn – Macau Ferry Terminal – Venetian.